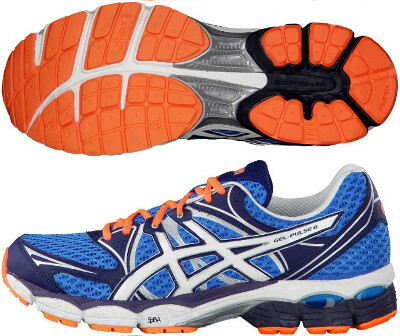 Asics Gel Pulse 6 are neutral cushioned running shoes. The Asics Gel Pulse 6 plays main role for Asics in mid range cushioned shoes for long distances giving high specifications for money. This version presents not many changes from its predecessor Asics Gel Pulse 5 and the most important one is the upper simplification through removal of overlays that results into a cool and modern design that improves breathability. Independently placed eyelets disperse lace tension creating a customized fit environment and enhanced upper comfort. In addition, reflective material produced by 3M company is used to increase visibility on low-light conditions. GEL® System and SpEVA® midsole material guarantee high class comfort and cushioning improving rebound characteristics and decreasing midsole breakdown on every stride. New blown AHAR outsole material delivers enhanced durability.